(January 22, 2006) -- Because we believe a major city election deserves more than one or two sentence word-bites, LBReport.com posts below extended excerpts of salient portions of the January 18 Mayoral candidate encounter held at The Grand event center, conducted by LB's Junior League and the LB chapter of the League of Women Voters.. Preparing a written transcript is laborious and time-consuming but we believe the end result is worth it. LBReport.com is proud to provide in-depth coverage, including newsworthy statements by candidates presented in detail and in context. [We invite readers to compare our coverage with what they may have read elsewhere]. Our in-depth coverage also provides a useful, readily accessible reference source. 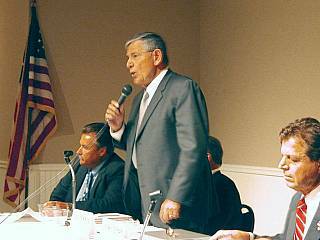 Five individuals explained why voters should elect them LB's next Mayor: retired 3d district Councilman Doug Drummond; incumbent 3d district Councilman Frank Colonna; retired So. 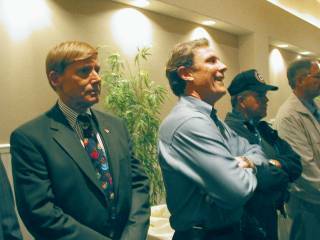 Cal Edison President Bob Foster; LBPD officer John Stolpe; and Ronnie Rephan [who wore a hat with a feather in its brim and made statements prompting mainly laughter from audience members]. Nearly 300 people -- a standing room-only crowd including prominent officials, political and community figures -- turned out to see and hear how the Mayoral candidates fared in their first encounter. 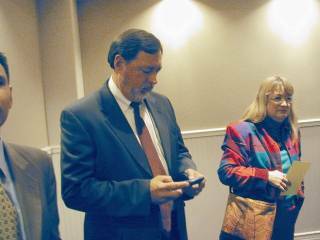 City Manager Jerry Miller attended and simultaneously stayed in touch on city matters via a high-tech Blackberry. 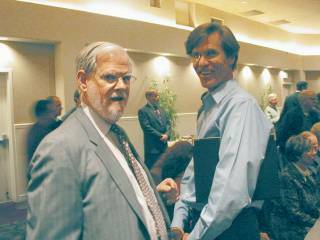 Two of the architects of LB's 2010 "Strategic Plan": LB lawyer and Community College Board of Trustee member Doug Otto (left) and now-former LB resident David Sundstrom (exited LB for PV). 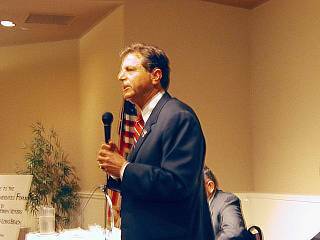 Former LB Airport Advisory Commission member, Elliot Fried, Ph.D, who's also exited LB (now a high desert-dweller). We asked as a wisecrack if we could refer to him as a refugee; he chuckled and said OK.
LB Harbor Commissioner Dr. Mike Walter, Ph.D.
Also spotted (not photographed) Harbor Commissioner Mario Cordero and Port of LB Community Affairs/Gov't Relations Dir. Carl Kemp. LBPD Administration Bureau Dir. Braden Phillips (left) with LBCC Board of Trustee member Jeff Kellogg. The event was not a debate. 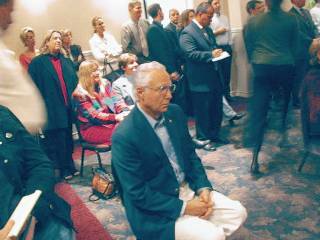 The format, used for years by LB's League of Women Voters, more closely resembled a restrictive press conference. 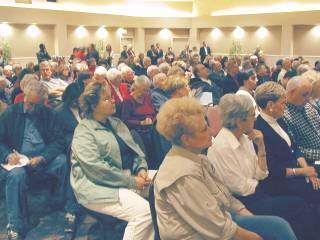 Audience members were invited to submit questions in writing, precluding questioner follow-up. Questions were then screened by League reps. 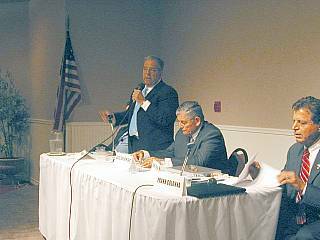 Questions were posed and the proceedings were moderated by veteran League of Women Voters' official Bea Antenore...who is separately a Mayor-selected, Council-approved appointee to City Hall's Parks & Recreation Commission. Questions were mainly (but not always) directed to all the candidates. Answers were limited to one minute. The audience was admonished not to applaud individual candidate responses (although a number of those attending ignored the admonition). Despite the constraints, the Q&A portion of the event produced enlightening and newsworthy responses. They follow below. Not all questions or candidate statements are included. Bracketed material is by us for clarity. Mr. Stolpe: ...I think that maybe we should put it on the ballot and let us the people decide...but we also have to remember that we need police service and we need to hire more police officers and we've got another tax coming up...But I firmly believe, put it on the ballot, let the citizens decide. I say put it on the ballot. Retired Councilman Drummond: I truly support the library...It needs to be fully staffed. It needs to be open hours in the evening and weekends. We need the libraries...[Regarding police/public safety, my background includes] 25 years teaching criminology at Cal State Long Beach and I can tell you, look at the young...men that are in penitentiaries, and I can tell you most of them are illiterate. It's a tremendous opportunity for the young people to go on and use the library after hours and weekends...I spent time in those libraries and I'm going to tell you we should have that on the ballot and we should vote. Mr. Foster: I too am in support of the libraries. I've been on the Library Foundation Board [private charitable group raises money for library-related matters]...It is a fundamental part of the city and more important than anything else, the libraries provide an opportunity for our disadvantaged and at-risk populations to have access to the internet and modern technology...I do believe that there are efficiencies in this budget that the libraries could have been funded. I am also in favor of making sure that we have full police protection, but I would support this being on the ballot. Ms. Antenore: ...What is your feeling about our Airport? Councilman Colonna: Taking the lead on the City Council, we moved the item forward to rebuild our terminal...A 102,000 square foot airport terminal is going to be absolutely phenomenal, it's going to serve all of the needs, it will be streamlined, it will be functional, it will have an adequate number of gates. It is going to be a beautiful corporate terminal that's also going to preserve the integrity of the Daugherty Field historical component...There was a lot of discussion involved in increasing the size...The first run that the Council had at this was about 26,000 square feet just for a food court [downsized in current draft EIR] and that's larger than [Ms. Antenore calls time]...we're going to make it the right size. Mr. Foster: The Airport does need to be modernized. It needs to be consistent with modern air travel and modern conveniences. Two things need to be connected to that: the first is the noise ordinance must be enforced and protected and in fact it has to be protected against challenges from outside, so things like a legal defense fund are things we should consider for the noise ordinance. And secondly, we need to make sure that this is a good business deal. We don't want to modernize this Airport and not have long enough-term leases to be able to pay for it. This has to be self-sustaining and self-sufficient but it does need to be modernized consistent with the noise ordinance and a good business deal. 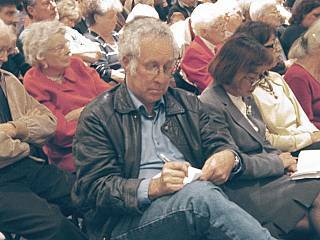 Ms. Antenore::...[m]ost of the people in this audience are questioning how do you feel about the vote on the Council on the LNG? Retired Councilman Drummond: ...Looking at the whole concept, you look at the potential ring of fire that would surround that facility in the worst case, and keeping in my the memory that today in this world of terrorism, you bring the ignition device to the bomb. That could be an awful situation and it could be destructive to a substantial amount of the Long Beach population. New technology the other day: there's a new proposal up state to bring it in off the coast, discharge it off the coast, changing it to the gaseous system at that point and running it underwater to the mainland and it would be wonderful. We need it to clean the air, but we don't need the threat to Long Beach's population. Mr. Foster: This is a public safety issue...There are 130,000 that live in a three mile radius of this proposed facility. It does not belong in a populated area. It should not be here. There are other alternatives, some of which were just mentioned. I've read the Environmental Impact Report. There are many deficiencies in it, not the least of which they didn't even consider alternatives off shore to this facility. It does not belong in this city...and I will do everything I can to keep this out of Long Beach. Councilman Colonna: As many of you know, on Council I took the lead in opposing Liquefied Natural Gas in our port and our downtown, from the very first time it came before us almost two years ago. I debated the Vice President of Mitsubishi on National Public Radio and I was on Jim Lehrer's television show on [PBS] opposed to this project. It doesn't belong in our downtown. It doesn't belong in our Port. The world's largest Port combined with Long Beach and Los Angeles, and we would jeopardize our entire economy not to mention the population. It's wrong for us. It belongs, if anywhere, off shore, and there's a discussion now going approximately 15 miles offshore, but there's two other locations off of Malibu and off of San Onofre. Until the process is refined and we have a much better opportunity for a safer city, there's no place for this here, it's a significant public safety problem. Ms. Antenore: Much has been done for the downtown area. Where would your emphasis be...in the next four years? Retired Councilman Drummond: Media reports from last year said that Long Beach was the 37th city in poverty in America in the year 2000 and now we're number six. We're going the wrong way at warp speed and then we talk about that increase in poverty, we're talking about declining neighborhoods. Our neighborhoods have to be number one. Not the corridors, the neighborhoods. The money has been spent downtown far too long. You look at the potholes in Long Beach today, they're not downtown. They're in the neighborhoods. They're in neighborhoods in every district in the city. They have to be fixed. Our streets have to be fixed. Our neighborhoods have to be improved. We have to have housing in those neighborhoods that our smart kids would want to stay in and not move away. Councilman Colonna: The fabric of our city is its neighborhoods. The renaissance that we're experiencing downtown is just the beginning. But if you remember what our downtown looked like a number of years ago, it was a place that we drove around, not through. What we need to do now is to concentrate on working with the homeowners associations and the leaders of all our neighborhood groups...[M]y plan is, and what I've always done on our City Council is not just to represent the Third district but the interests of the entire city. Just last week at the City Council meeting, I suggested and the City Council supported a program, to bring in solar powered street lights, not only in the Belmont Shore area but also to look for our infrastructure opportunities in the redevelopment areas which are going to be the next renaissance in Bixby Knolls, in North Long Beach and in the westside. Ms. Antenore: [segues from Councilman Colonna's preceding answer into question to Colonna]...How do you think you could possibly and realistically get 300 more officers on the police [department]? Ms. Antenore: ...Mr. Foster...somebody wants to know what your plans would be to reduce gang activity and violence in the schools or near the schools? Ms. Antenore: As the city entered the new millennium, we were in a healthy, financial position, according to this question. How did our finance troubles begin, how did they happen, and what do you pledge to do to assure that it doesn't happen again? Ms. Antenore: It's been interesting in the news lately that pensions have been a very important feature in all labor contracts and in many areas of our community. Now our pension system in the city has perhaps been a fault, perhaps the way it is working right now, it has hurt our budget. What would you do? Would you change it? Go back to before 2002? Or how do you think you'd handle it? Retired Councilman Drummond: One thing we have to understand is that we're stuck with it for the current employees. You can't take it away from them, but you can change the process so that middle income employees will not be under that pension plan. One of the things that happens is it changes the total compensation received for the employees. You have to combine their hourly wage, their medical benefits, the cost of the pension, all of that, and I believe that we have to shovel that total compensation figure out there in front of everyone so they fully understand what's happened. San Diego is near bankruptcy. It's a disaster. Believe me, if we continue to operate that way, we're going to be in bankruptcy as well. Councilman Colonna: We took this budget challenge very seriously with our pensions, and I have to tell that we just completed negotiations once again and we are now in a second tier with new employees. It was something that actually myself and a large number of Councilmembers insisted upon. We also have employees making a contribution, actually 2% into their pension fund, which was something that hadn't been done for well over 18 years. And we have a fully funded pension program. We owe no money. We pay currently in the fund. We had an option last year to have borrowed money in order to make the fund current and we didn't need to do that, so our books are clear. We've got a strong pension fund. We've got a strong force of city employees and we are tightening our belts and making sure that any mistakes that we made in the past will never be repeated and that's a guarantee. Mr. Foster: ...This was something that should not have taken place...You can't take it away. The solution is going to be a very disciplined approach on two levels. First of all, you have to [inaudible] at the bargaining table and some of the new contracts, for police for example and the proposal for miscellaneous employees, have impact, where the employees are paying part of that pension that eases the burden on the city. And there's also a proposal to have a two-tier system, where new employees are on a different pension program. Those are the only two solutions with us. And we're not in a San Diego situation but this is something that requires fiscal discipline, it's something that probably should not have occurred. Certainly we're going to have to be vigilant.